Researchers have finally been able to produce metallic hydrogen, a complex and elusive state that was firstly theorized more than 80 years ago. Dr Ranga Dias and Professor Isaac Silvera from Harvard University were able to achieve this impressive feat by cooling down hydrogen to 5.5 Kelvin (-268C/-450F), while compressing it to astaggering pressure of 4.8 million atmospheres. The breakthrough is reported this week in Science. The incredibly high pressure was achieved by using diamond anvil cells. But it was not a straightforward approach. Scientists have been trying to get to this pressure for many years, and although they’vealmost got there, only now have scientists got the right set up. In its standard form, hydrogen is a molecular gas with its atoms bound in pairs, each sharing an electron with theother. When hydrogen was placed between the anvils, the pressure mounts and things get weird. At a pressure of 3.2 million atmospheres, hydrogen becomes opaque (hence the nickname black hydrogen) and is also a semiconductor. But only a much higher pressure can break the molecular bonds and create the metallic hydrogen phase. The gas was turned into a metal, with the expected properties an atomic metal has. The two researchersbelieve metallic hydrogen is a solid, but the team wasnt able to confirm itexperimentally. This peculiar phase of hydrogen was first predicted in 1935 by E. Wigner and H.B. Huntington, and since then achieving this has become the holy grail of high-pressure physics. But Wigner and Huntington were wrong in their estimation of the necessary pressures. 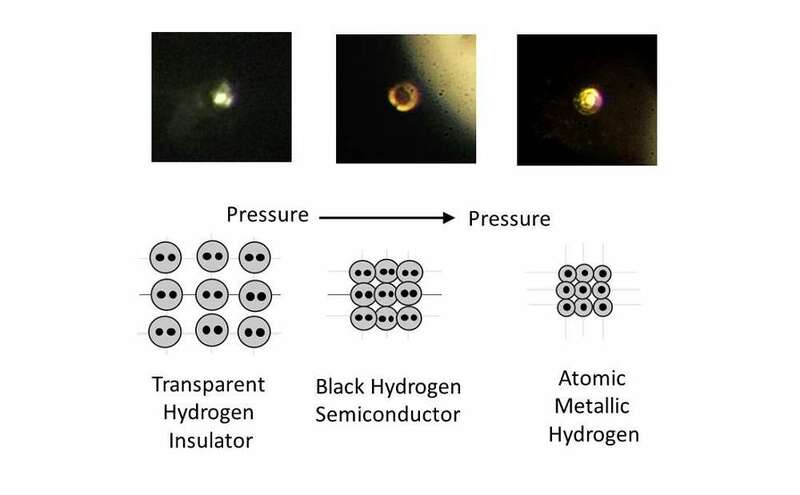 They thought metallic hydrogen could be achieved with a pressure of 250,000 atmospheres, almost 20 times smaller than what has been necessary to make it in real life. Creating metallic hydrogen is not just a triumph of science for the sake of science. Understanding the metallic properties of the most abundant element in the universe has a multi-disciplinary impact. Metallic hydrogen is thought to be metastable at room temperature after the pressure is removed, so it could be used in nuclear fusion. It is also believed to be a high-temperature superconductor, which would be an incredible breakthrough if confirmed. And even astronomy might benefit from this the core of Jupiter, Saturn, and exoplanets could be made of metallic hydrogen.